Today was such a lovely spring day made all the more beautiful with the arrival of my latest cosmetics purchase. In the famous words of the Pointer Sisters—I’m so excited!! Over the past couple of weeks, I’ve been updating my makeup arsenal for spring/summer. One of the things on my list were new lip colors and thanks to a video I saw on Instagram I went with the Mis Amores Lip Palette created by makeup artist and blogger, Iris Beilin, exclusively at e.l.f. Cosmetics. 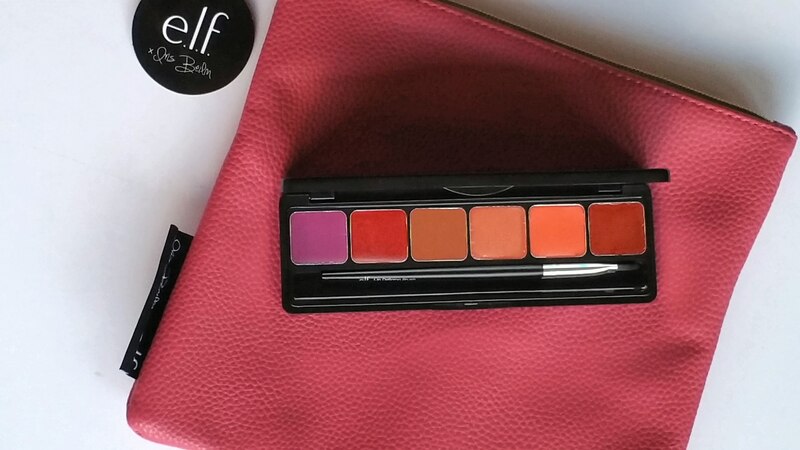 The six vibrant shades offer a nice selection and with the purchase of the palette, I got a hot pink pouch which will come in handy as a makeup bag. Cruelty-free with zero animal testing is one of the best features of e.l.f. products. However, I recommend checking them on Beautypedia, a skincare and makeup review site, who base their reviews on published medical and scientific research for details on specific products. OMG, of course! An eyebrow stencil! That would be a great help for you! Hey Hari!! How are you??? I’ve got to pop over to your place. The stencils are awesome but sometimes my eyebrows are a little askew because I didn’t line them up properly but life is too short to sweat it. I’m good Steph! Ahhh, is it better or worse than just doing it by hand? I prefer using the stencils vs by hand. I wish I would have thought to use them prior to vision loss but it’s all good. Love cruelty free no animal testing cosmetics! Yeah!! How fun…. :) getting new make up at your doorstep. Fabulous! Sooo, I’ve bought the natural look lashes, but I cannot figure out how to apply them close to the lash line. If you have any tips or tricks, I would love to hear them! Hahaha! I’m not laughing at you but with you because you and I are in this together. I wish I had some tips because I’ve been having the same issue and the moment I seem to get it close to the lash line it ends up on my cheek. One IG follower told me once to use both hands to apply them. I was trying with tweezers thinking it would be easier. I’ll follow up with you to let you know how it’s coming along. I always feel like a little kid when I get a package in the mail. Even a padded envelope can sometimes do the trick because my mind is telling me “goodies” but on opening it something boring like some literature an a flash drive.